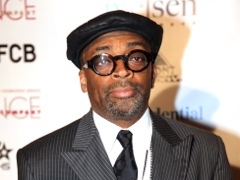 SANFORD, Fla. (AP) — Spike Lee has apologized to a Florida couple who say they were forced to leave their home when a Twitter posting that the director helped spread listed their address as that of a man who shot an unarmed teenager. Elaine and David McClain are in their 70s and say they have a son named William George Zimmerman who lived in their Sanford-area home in the mid-1990s. They say he is no relation to 28-year-old George Zimmerman who killed 17-year-old Trayvon Martin on Feb. 26. The killing has touched off widespread public outrage and protests across the country, including from Lee and other celebrities, because Zimmerman was not arrested. He says he acted in self-defense.